A daily Task List Templates is generally generated by small business owners or HR managers for the employees. As the name suggests, this piece of the document includes all the tasks that employees need to perform on day to day basis. With such scheduling, it becomes easier to work on various client projects. Project task list template does not only help to trigger systematic approach for project development, but also aids to complete the project within the scheduled time frame. 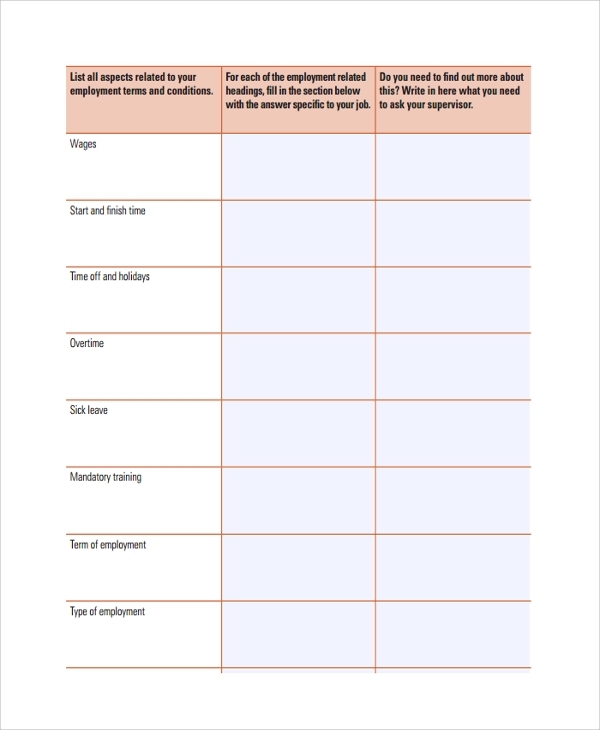 HR managers or team leaders or even projects managers can use this template to create a flawless and easy to understand daily task list for their employees. The template comes in PDF format, which is easily printable. Scheduling daily works for employees enhances their productivity and helps to conclude the projects with more perfection. 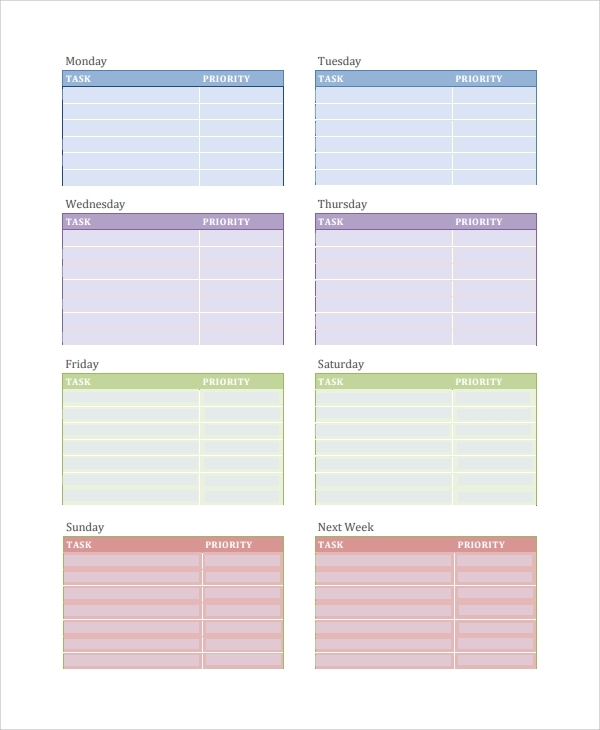 To create a daily work list for employees, this PDF template can be used. 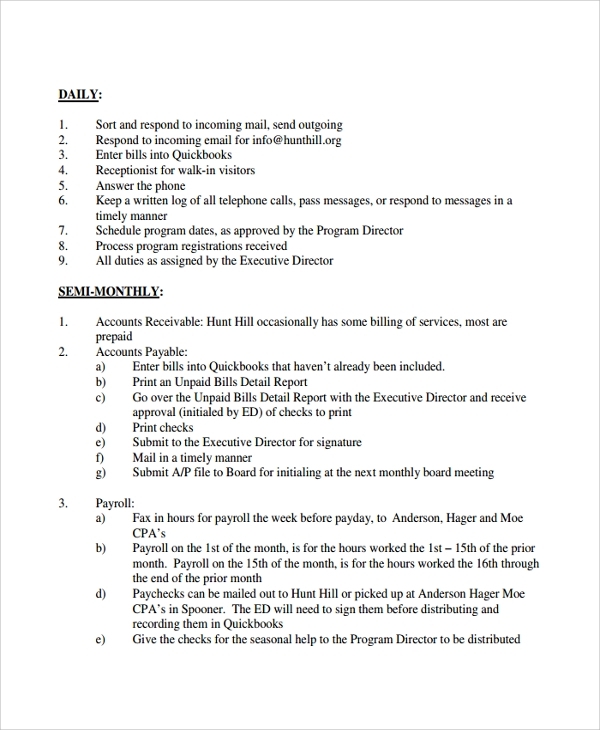 Print the document, and add daily tasks systematically for the employees. Creating list for daily jobs for employees helps to avoid a lot of hassles. Employees do not need to contact team leaders or managers on a daily basis, asking for their tasks. A daily work list will act as a guideline for them. It enhances the productivity of the employees within an organization. 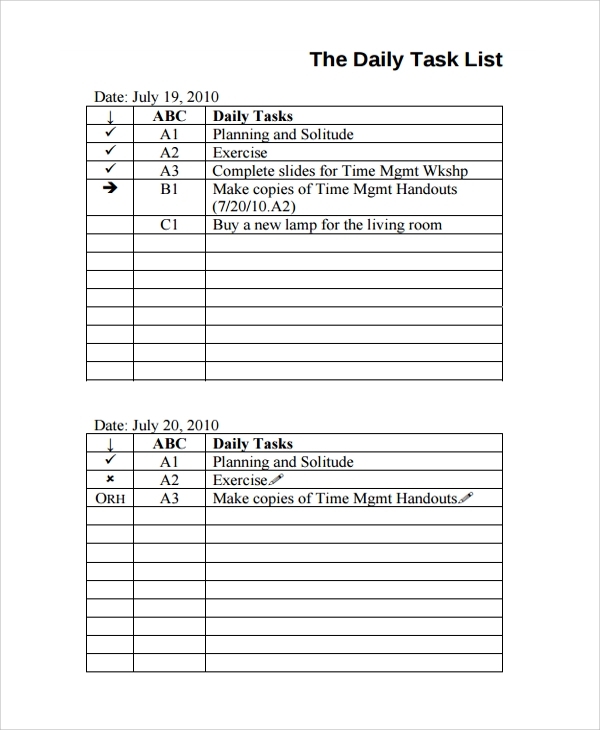 A daily task list should be created to manage the day to day tasks in an organized way. 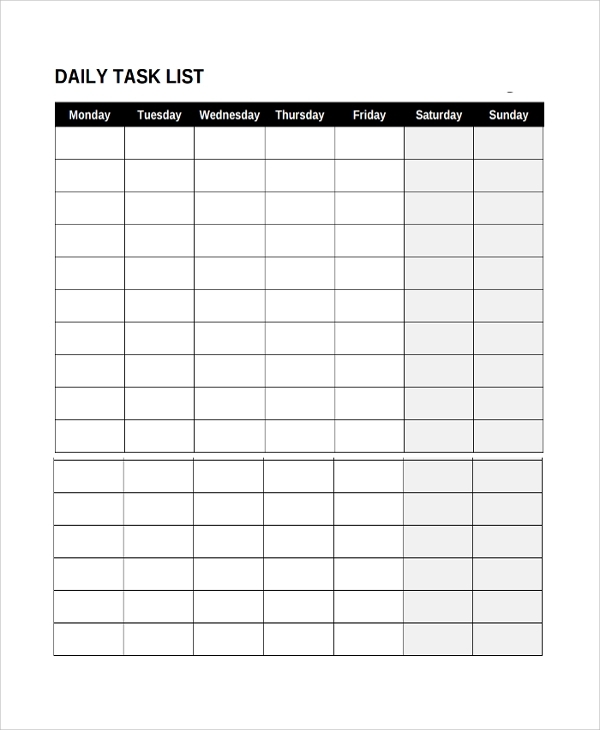 You can download this printable template for creating a daily task list for the employees. It comes with a standard format so that the list can look organized and well structured. What are the uses or Purposes of Daily Task List? 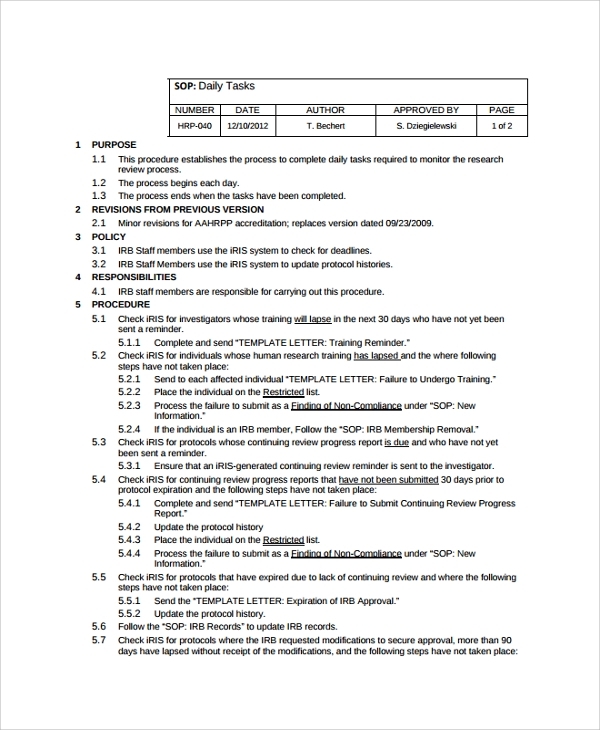 A daily task list has been used by various professionals. 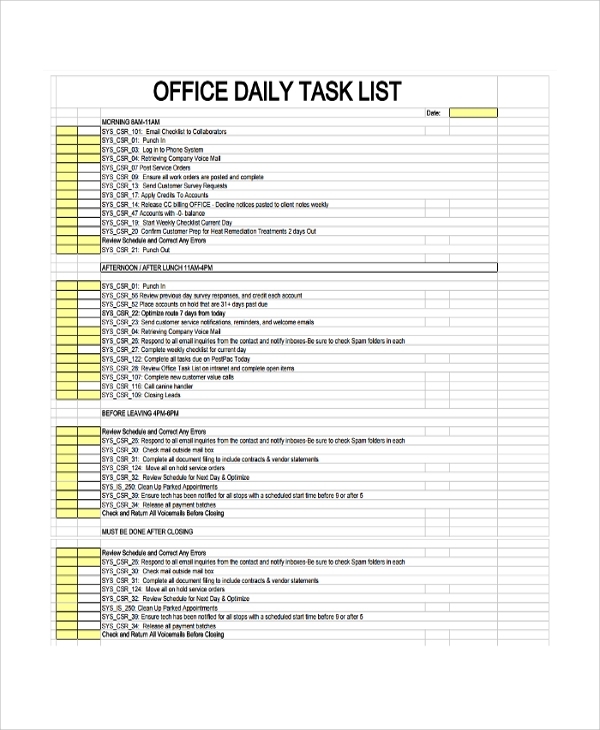 As the name implies, daily task list consists of day to day basis task schedules for a person. It can be created for a team of employees or for an individual. HR managers or project managers or team leaders generally create such list to conduct works systematically. Freelancers use to create their daily task list to enhance their productivity and to schedule their working time. On the other hand, business managers or owners or directors may also need daily task list to work on the jobs at their hand on a priority basis. What are the Benefits of Daily Task List? 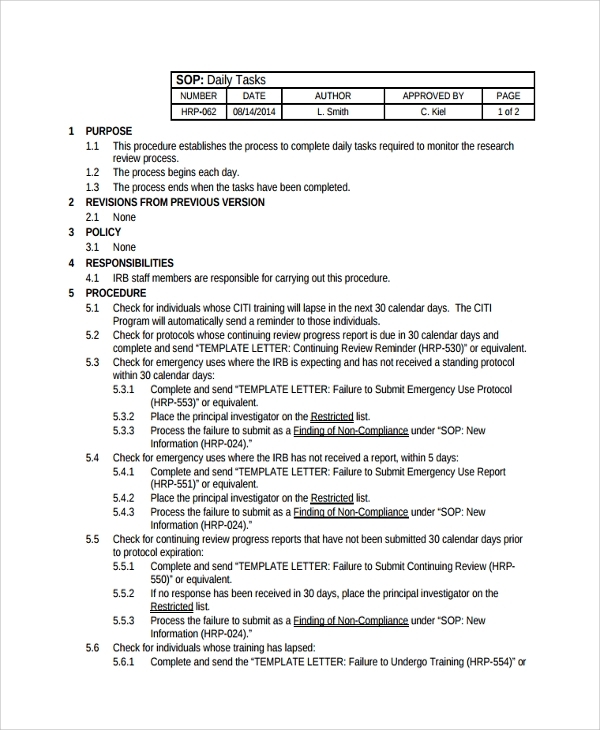 Why Should you use Daily Task List Template? An organization or even an individual has to perform various tasks on daily basis. Scheduling the day to day tasks is an effective idea to complete them with precision and to conclude the tasks on a priority basis. With Sample Task List Templates, you can plan and list down your day to day tasks flawlessly.